The Calgary Flames have looked to their captain in a bid to bolster the quest for their first division title since the 2005-06 season. Mark Giordano carries a seven-game point streak (two goals, eight assists) into Monday's action as the Flames bid for their seventh win in eight outings in the opener a three-game homestand against the Los Angeles Kings. "He deserves every accolade he's getting. 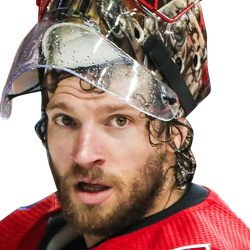 He's one of the biggest warriors I have ever played with," goaltender Mike Smith told reporters of Giordano, who scored a goal and set up two others in Saturday's 3-1 victory versus Vancouver that pushed Calgary six points up on second-place San Jose in the Pacific Division. Giordano (72 points in 73 games) became the first defenseman aged 35 or older to reach the 70-point plateau since seven-time Norris Trophy recipient Nicklas Lidstrom in 2007-08. While the Flames reached triple digits in points for the first time since their Northwest Division-title winning team in 2005-06, the Kings mustered just eight points in an 18-game stretch (2-12-4) before posting back-to-back victories in their last two outings. Jeff Carter scored for the second time in as many consecutive contests in Saturday's 4-3 shootout triumph over Anaheim after going 20 games without a goal. ABOUT THE KINGS (27-39-8): Kyle Clifford, who is slated to play in his 600th NHL game on Monday, scored his first career power-play goal in the first period versus the Ducks. "I think the last couple of games we have played with more mental toughness," the 28-year-old told reporters. "We are not letting the things during the game affect how we play, so you know we are just keeping it simple and when things go wrong we keep pushing." Dustin Brown extended his point streak to four games (three goals, three assists) after notching an assist on Saturday. ABOUT THE FLAMES (47-21-7): Calgary is receiving significant contributions from its fourth line, as Andrew Mangiapane is riding a three-game goal streak, Garnet Hathaway has scored and set up a goal in back-to-back contests and Derek Ryan collected four assists in his last three games. "That line's been real good," coach Bill Peters told the media. "The difference is, they're finishing off more plays than they did earlier in the year. They're starting to get rewarded for their effort." Mikael Backlund, whose 20 goals are two shy of his career high set in 2016-17, scored twice and set up another in Calgary's 4-1 victory versus Los Angeles on Nov. 30. 1. Calgary LW Johnny Gaudreau boosted his point total to 21 (six goals, 15 assists) in 19 career meetings with Los Angeles after scoring in the most recent encounter. 2. Kings RW Adrian Kempe has scored his team's lone goal in two games against the Flames this season. 3. Calgary F Elias Lindholm has been held off the scoresheet in nine of 11 contests this month. Under is 4-0-1 in Kings last 5 vs. a team with a winning record. Kings are 0-4 in their last 4 Monday games. Kings are 1-7 in their last 8 when their opponent allows 2 goals or less in their previous game. Kings are 1-7 in their last 8 games as a road underdog. Kings are 1-7 in their last 8 road games. Under is 4-0-1 in Flames last 5 overall. Under is 3-0-1 in Flames last 4 games as a favorite. Over is 5-0 in Flames last 5 Monday games. Flames are 5-0 in their last 5 home games vs. a team with a road winning % of less than .400. Under is 9-1-2 in Flames last 12 after allowing 2 goals or less in their previous game. Kings are 5-11 in their last 16 games as a road underdog of +110 to +150. Kings are 5-11 in their last 16 games as a road underdog of +151 to +200. Kings are 2-5 in their last 7 games as an underdog of +110 to +150. Kings are 10-26 in their last 36 games following a win. Kings are 10-30 in their last 40 vs. a team with a winning record. Kings are 5-16 in their last 21 overall. Kings are 2-7 in their last 9 games as an underdog of +151 to +200. Kings are 6-21 in their last 27 games as an underdog of +201 or greater. Kings are 6-21 in their last 27 games as a road underdog of +201 or greater. Kings are 3-15 in their last 18 games as an underdog. Kings are 1-5 in their last 6 road games vs. a team with a home winning % of greater than .600. Kings are 2-11 in their last 13 games playing on 1 days rest. Flames are 6-1 in their last 7 overall. Flames are 5-1 in their last 6 Monday games. Flames are 9-2 in their last 11 games as a home favorite of -110 to -150. Flames are 4-1 in their last 5 after allowing 2 goals or less in their previous game. Flames are 30-9 in their last 39 games playing on 1 days rest. Flames are 21-7 in their last 28 games as a home favorite. Flames are 14-5 in their last 19 games as a favorite of -110 to -150. Flames are 21-8 in their last 29 home games. Flames are 23-9 in their last 32 games following a win. Flames are 43-17 in their last 60 games as a favorite of -201 or greater. Flames are 5-2 in their last 7 games as a favorite of -151 to -200. Flames are 39-17 in their last 56 games as a home favorite of -201 or greater. Flames are 39-17 in their last 56 vs. a team with a winning % below .400. Flames are 37-17 in their last 54 games as a favorite. Over is 4-1 in Kings last 5 games as a road underdog. Over is 4-1 in Kings last 5 road games. Over is 7-2 in Kings last 9 games playing on 1 days rest. 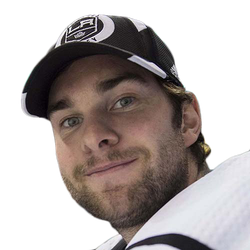 Over is 9-3 in Kings last 12 when their opponent allows 2 goals or less in their previous game. Under is 3-1-1 in Kings last 5 games as an underdog. Under is 3-1-1 in Kings last 5 games as an underdog of +151 to +200. Under is 3-1-1 in Kings last 5 vs. Western Conference. Under is 19-7 in Kings last 26 Monday games. Under is 8-3 in Kings last 11 games as an underdog of +201 or greater. Under is 13-6 in Kings last 19 games following a win. Over is 17-8-1 in Kings last 26 overall. Under is 33-16-7 in Kings last 56 games as a road underdog of +110 to +150. Under is 33-16-3 in Kings last 52 vs. Pacific. Under is 7-1-3 in Flames last 11 games following a win. Over is 5-1-1 in Flames last 7 games as a home favorite of -110 to -150. Under is 5-1-1 in Flames last 7 vs. Western Conference. Under is 4-1-1 in Flames last 6 games as a favorite of -201 or greater. Under is 4-1 in Flames last 5 vs. Pacific. Under is 7-2 in Flames last 9 vs. a team with a winning % below .400. Over is 6-2-1 in Flames last 9 games as a home favorite of -201 or greater. Under is 6-2-1 in Flames last 9 games playing on 1 days rest. Over is 11-4-3 in Flames last 18 games as a home favorite. Over is 32-15-5 in Flames last 52 home games.